Pregnancy is a very special and exciting time for expectant women and their families. At this time, many moms-to-be make careful choices to try and do what’s best for themselves and their babies. Wondering what’s the right way to take care of your oral health when you’re expecting? Here are answers to a few of the most common questions about dental care during pregnancy. Q: Does pregnancy make a woman more susceptible to dental problems? A: Yes. Pregnancy causes big changes in the levels of certain hormones, and these in turn have a powerful influence on your body. For example, many expectant moms experience food cravings and morning sickness at certain times. Changing hormone levels can also affect your oral health in various ways, including making your gums tender, swollen, and highly sensitive to the harmful bacteria in plaque. Q: What are “pregnancy tumors” in the mouth? A: These are benign (non-cancerous) overgrowths of tissue that sometimes develop on the gums during the second trimester. Often appearing between the teeth, these swollen reddish growths are thought to be caused by plaque bacteria. They sometimes go away on their own when pregnancy is over, but may be surgically removed if they don’t. Q: Is it normal to have bleeding gums during pregnancy? A: It’s not uncommon, but it does indicate that you need to pay careful attention to your oral hygiene at this time. Pregnancy hormones can cause the tiny blood vessels in your gums to become enlarged; when plaque bacteria are not effectively removed from the mouth, the gums may become inflamed and begin to bleed. This condition is often called “pregnancy gingivitis.” If left untreated, it can progress to a more serious form of gum disease called periodontitis. That’s one reason why regular brushing and flossing are so important during pregnancy — as are routine professional cleanings. Q: Is it safe to have dental cleanings and checkups during pregnancy? A: Yes; in fact, it’s a very good idea to have at least one. Studies have shown that women who receive dental treatment during pregnancy face no more risks to their developing babies than those who don’t. On the other hand, poor oral health is known to cause gum disease, and is also suspected of being linked to adverse pregnancy outcomes. Routine dental exams and professional cleanings can help you maintain good oral health and avoid many potential problems during this critical time. Q: Should I postpone more complicated dental work until after I have a baby? A: It depends. A study recently published in the Journal of the American Dental Association found it was safe for pregnant women to have routine procedures like fillings, root canals, and extractions, even if they require local anesthesia. So treatments that are essential to an expectant mother’s health shouldn’t be put off. However, if you’re planning to have cosmetic dental work, it might be best to err on the side of caution and wait until after your baby is born. So, you’ve just acquired an attractive restoration with dental implants. You may be thinking at least with these teeth you won’t have to worry about dental disease. Think again. While the implants and their porcelain crowns are impervious to decay the surrounding gums and bone are still vulnerable to infection. In fact, you could be at risk for a specific type of periodontal (gum) disease called peri-implantitis (inflammation around the implant). Bacterial plaque, the thin bio-film most responsible for gum disease, can build up on implant crowns just as it does on natural tooth surfaces. If it isn’t removed with daily brushing and flossing and regular dental cleanings the bacteria can trigger an infection in the gums. Besides weakening gum tissues, gum disease can also cause bone loss, of critical importance to dental implants. An implant depends on the bone they’re inserted in to hold them in place. If the bone around an implant becomes infected it could begin to be lost or dissolve (resorb), which could lead to loss of the implant. That’s why it’s critical to keep the natural tissue structures supporting your implants infection-free. 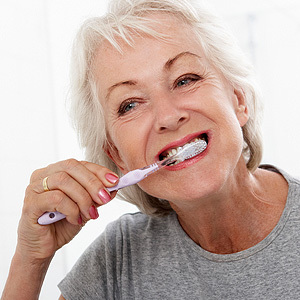 Not only is daily hygiene a must, but your implants and any remaining natural teeth should undergo professional cleaning at least twice a year or more if your dentist recommends it. Cleanings involving implants will also be a bit different from natural teeth. While the dental materials used in the crown and implant post are quite durable, regular cleaning instruments can scratch them. Although tiny, these scratches can become hiding places for bacteria and increase your risk of infection. To avoid this, your hygienist will use instruments (known as scalers and curettes) usually made of plastics or resins rather than metal. The hygienist may still use metal instruments on your remaining natural teeth because their enamel can tolerate metal without becoming scratched creating a smoother surface. While keeping implants clean can sometimes be a challenge, it’s not impossible. Implants on average have a long-term success rate above 95%. With both you and your dentist caring and maintaining these state-of-the-art restorations, you may be able to enjoy them for decades.